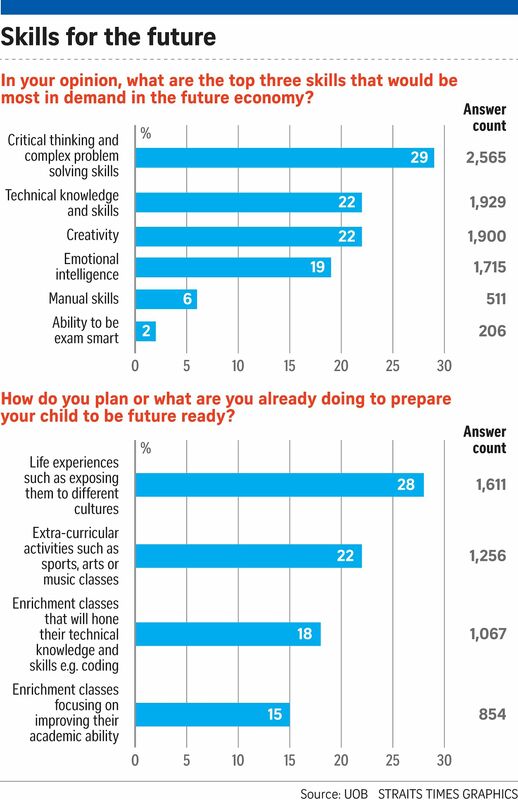 Singaporean parents largely agree that exam smarts are out, and critical thinking, creativity and emotional intelligence are in. A survey by United Overseas Bank of 2,942 respondents, including 2,156 parents, found that only 2 per cent felt that children need to be "exam smart" in order to fare well in the future economy. When asked to pick the skills they thought would be most in demand in future, 29 per cent chose critical thinking and complex problem solving skills, 22 per cent picked creativity and technical knowledge and skills, and 19 per cent cited emotional intelligence. And to prepare their children to be future ready, 28 per cent said they were exposing them to "life experiences" and different cultures, 22 per cent said their children were engaged in extra-curricular activities such as sports, arts or music classes, while 18 per cent said they were investing in enrichment classes that will hone technical knowledge and skills such as coding. Enrichment classes focusing on improving academic ability were the least popular option, cited by only 15 per cent of respondents. To help them in the journey of raising future-ready children, 32 per cent of the respondents felt that the Government should provide grants or subsidies for enrichment classes in areas that relate to future growth sectors, while 23 per cent said enhancing childcare subsidies would also help. Just as important, they felt, was that the Government should focus less on academic achievements - something that was cited by 26 per cent of the respondents. Most of them - 65 per cent - also felt that the children-related and education development initiatives in Budget 2017 will help prepare children for the future economy. Ms Jacquelyn Tan, head of personal financial services at UOB Singapore, said the jobs of tomorrow will demand a different set of skills. She noted that for parents today, it is difficult to predict which sectors or job scopes will thrive in the future economy, but it is fair to say that children who pursue what they are naturally good at and have a passion for will be more likely to excel in their chosen career. "This means identifying your child's natural talents and investing and saving in suitable financial solutions that will give you the means to nurture these gifts as your child grows," she said. To that end, the bank introduced the UOB KidSmart programme to enable parents to plan financially as they support the development of their child's natural gifts. The programme uses an aptitude assessment tool to help parents identify their child's natural talents. This then helps them to determine a financial plan, from savings to investment solutions, to develop their child's potential.